The show started with the scene that I thought was one of the best teasers that AMC had given us before the show started. It’s the one where Nick wakes up in the church and sees his girlfriend going all-out zombie and eating people. He then runs out of the church, looking particularly terrified, and promptly gets hit by a car. And yeah, it was slow because there was a lot of setting up the back story of the characters. But here’s the thing – that first episode of TWD was ALSO a bit slow. I remember it because I can recall being unsure if I was going to continue watching the show. So, yes, it was slow and I think people were expecting too much from it. And I think that going forward, it is going to get a lot better and quicker paced since we’re getting those back stories established. Now, let’s talk about this zombie virus. At the beginning of the episode, they were making it seem like maybe something in the drugs that Nick and the other junkies were taking are to blame for the outbreak. But then we learn about the “flu” that is keeping a lot of people out of school and work. Then, there is the guy who goes all zombie on the EMT during the traffic accident. 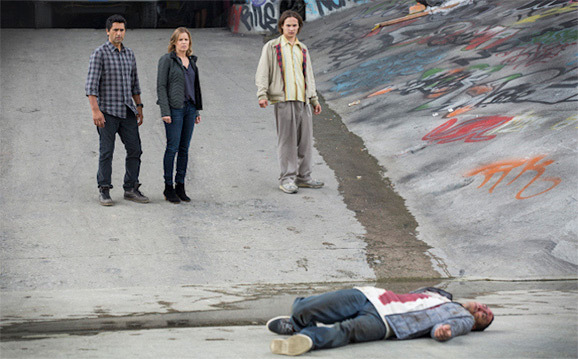 And, of course, when Nick kills his dealer we see him go all zombie. So, it’s not the drugs or the flu – so what is it?! I can’t wait to see what we get on the virus backstory from this show. What about you? Share your thoughts on our Facebook page.